Never stained or finished,still “raw”. Nice sharp edges and corners, very smooth surfaces and no stains, water rings or spots. Both cabinets have slight veneer damage in one spot along the side edge and was repaired but still slightly visible if you look for it. Grills and badges show no wear or damage. These guys may have spent a lot of time in storage because markings on the boxes indicate they were purchased at a Military Exchange in Germany. Also their condition shows signs of limited exposure. I’m asking $500 but of course local pickup can save you some money. I’ll try to get more photos on here later but I could just email if your interested it these. 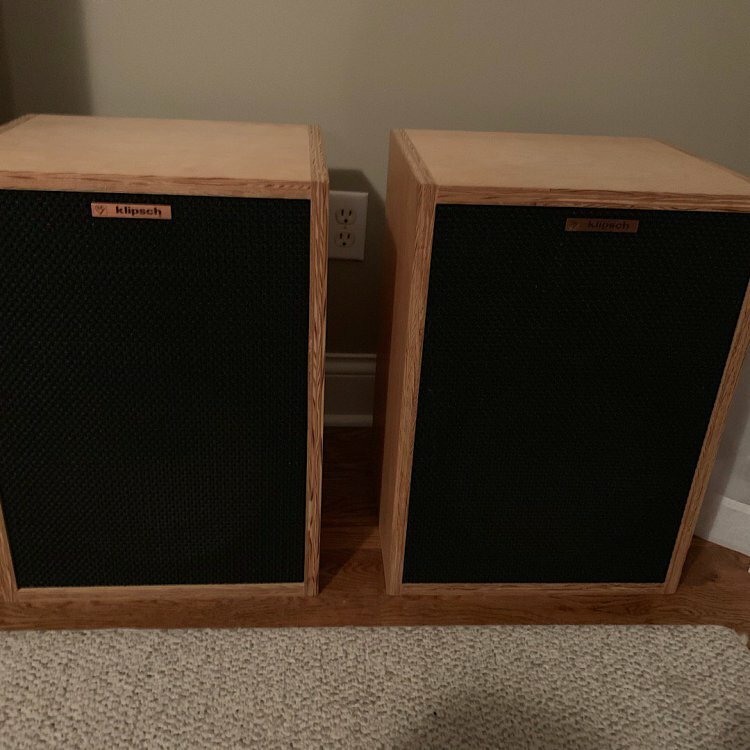 I took a good look at these speakers when I met Scallywagger last year. I purchased a pair of Heresy's from him for my "Super Heresy" project. If original condition is what you value, these are very special speakers at a very good price. The question came up about the components contained within. There are a lot of members on here from Chicago Area that often have deals on Heresys and Cornwalls. Maybe some of them will see this and be able to help you out. You can also post in the Garage Sale section that you are looking to buy and keep an eye on the alerts section where members post links to Craigslist, Estate Sales and other sources. It's good I'm not in country at the moment or I would be tempted to make a 30 minute drive to get these... Why did I not remember you are so close? Okay, bought, paid for, and officially off the market. Congratulations Teaman, and thanks too all have contributed to this thread. Especially our pony express rider in Rome Ga for the transportation. It wouldn’t have happened without you Jerry. Absolutely, thank you so much Jerry! I'm feeling a Super Heresy 2.0 being built in the near future, eh??? Looks like I need to get back onto finishing up that project.